Brand - Warmeo, Series - Steam, Manufacturer - Anmol, Material - Stainless Steel, Shape - Round, Colour - Silver, Capacity - 1000ml+1500ml+2500ml, 3Pcs Gift Set. Kick Start Your Day On An Energetic Note.High Quality Stainless Steel Casserole Made Of 201 Grade Stainless Steel Utensil Material.Stainless Steel Material Used Is Non Magnetic, Non Toxic And Free Of Any Harmful Coating. Special Quality Polyurethane Is Used For Insulation Which Helps To Retain The Heat And Keep The Food Fresh For A Long Time.Mirror Finish Polish Gives The Product A Stylish And Presentable Touch Which You Can Definitely Flaunt On Your Dining Table. 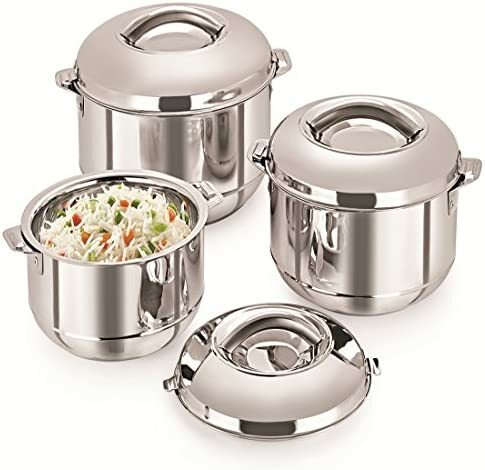 Easy Locking System Is Installed In The Lid Which Has A Sturdy Steel Handle To Make Sure The Food Inside Remains Steaming Hot.Strong Safe & Healthy Double Walled Insulation With Unique Design, Unique Pushing & Locking System To Stay The Food Hot & Cold For Long Time. Package Dimension - Height - 24cm x Length - 61.5cm x Width - 12cm. Net Weight - 2.390Kg. Package Contains -3Pcs For Gift Set Main Casserole With Lid.